﻿ Process Heat & Controls, Inc. Process Heat & Controls, Inc. Since 1973, Process Heat And Controls has supplied to the manufacturing industry. We supply Band Heaters (Mica Bands, Ceramic Bands, MI Bands, Cast Aluminum Bands), Cartridge Heaters of all sizes, Immersion Heaters (Flange, Screw Plugs), Strip Heaters (Mica Strips, MI Strips, Channel Strips, Finned Strips), Ceramic Infrared Heaters (Black Body, Chameleon Ceramics) and Radiant Heaters. We also supply Athena Temperature Controls and Mold Controls, all styles of thermocouples and RTDs, Walton Stout replacement open coil elements, comfort blower heaters, explosion areas, too. We have relays of all types (Mercury, Solid State, Mechanical), all types of filters (compressor, hydraulic, HVAC) and all grades of Process Lube hydraulic oil. 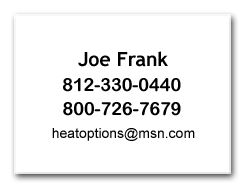 Just give us a call at 800-726-7679 or Email Joe at heatoptions@msn.com. We'll be happy to help find a solution to your needs. This website contains only a sampling of the products we supply. If you don't see exactly what you're looking for, give us a call. We may be able to get it for you! Please check back often as new products are being added frequently.